Oops, forgot to post this one last night. Where did that phrase come from? I remember seeing it on an HPL-parody version of “The Family Circus” comic. I’m unsure of the exact lineage. I think it was originally associated with Lovecraft, but then got co-opted by lolcats and the Family Circus strip you mentioned. Not sure which occurred first. Amusingly, (to me, anyway) this image brings the phrase back around to it’s home, as I may not have put it up here had it not been for the lolcat diversion. That’s a trippy image. Very appropriate for the caption! Isn’t it from Frank Bellknap Long’s “The Hounds of Tindalos”? The main character that isn’t the narrator takes a drug that allows him to see infinitely in to the past, present and future. Or at least something along those lines. And I’ve seen that picture on the net while doing a Google Image search for Tindalos. 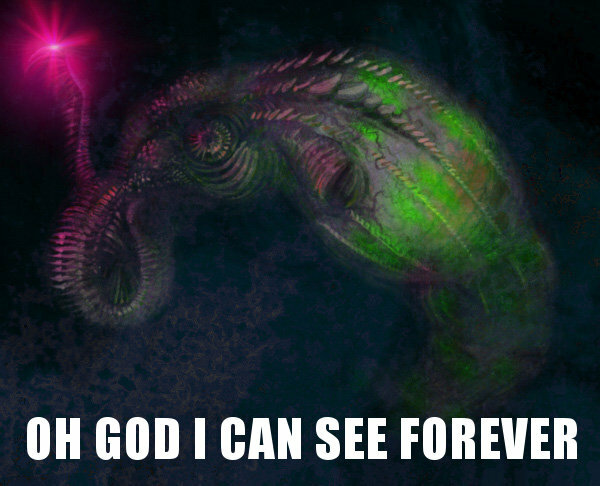 Cthulhu on acid. A terrible thought. To see all there is to know is to be omniscient. To be Omniscient is to go stark raving mad, therefor if there is a God he is a madman. Mad by who’s standards? And why assume that a being, other than human, would become mad by knowing all? You *know* what assuming does, don’t you? Hmmm? Seeing as it’s his universe and his characters and his gods. It’s literature, author gets the final say.